About this course: This e-learning course is designed for the training of both Divers and Supervisors who maybe using NITROX during diving operations. The recommended time for course completion is from 6 to 8 hours. Surface supplied diving is sometimes carried out using a breathing gas mix of oxygen and nitrogen with a higher percentage of oxygen in the mix than in natural compressed air. The common industry terminology for such a gas mix is NITROX. Diving while breathing NITROX has various advantages and disadvantages, one such advantage is that the required decompression time for any particular dive can be reduced in comparison to the same dive using natural compressed air. The technique is normally used to ensure that particular dives can be carried out without the diver requiring any decompression but in other cases is used to ensure that very lengthy decompression is not required. The dive plan for the use of NITROX needs to consider all the relevant safety considerations of using this technique in place of natural compressed air. One of the main safety considerations not normally present when breathing compressed air is the increased risk of oxygen toxicity problems, particularly those occurring while the diver is still under water. This e-learning course is designed for the training of both Divers and Supervisors who maybe using NITROX during diving operations. The course has been developed using the guidance documents and references provided by International Marine Contractors Association (IMCA), the International Oil and Gas Operators Association (IOGP), USN Diving Manual Revision 6 and industry best practice. Divers, Standby Divers, Supervisors and Equipment Technicians, Project Engineers, Client Representatives, Diving Operations Managers, Offshore Medics or anyone who works offshore with diving projects using NITROX as the divers breathing medium (gas). Delegates who have successfully completed the course will be requested to proceed to the online (multiple-choice questions) examination. 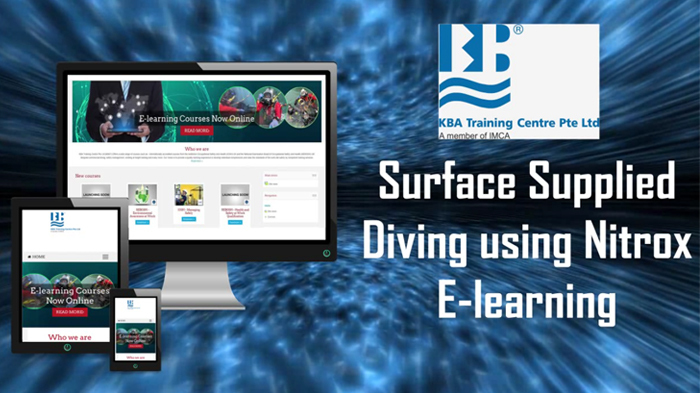 On successfully completion of both the course and the online examination, delegates will be awarded with a KBA Training Centre Pte Ltd e-certificate ‘NITROX Diver Training Course - eLearning’.